Thirteen years before the DCI World Championships went to Orlando in 1996 for the first of four visits, the 1983 events were held in Miami, Florida at Orange Bowl Stadium. The visit to Miami was good for the Garfield Cadets, who became the first corps from an eastern state to win the DCI title. Particularly memorable was the amazement of the audience at the new style of visual formations that Cadets' drill writer George Zingali introduced to the activity. Miami was also good for Florida's Suncoast Sound, in its first of seven finalist appearances. Two records were set in Miami that remain to this day: the 11th place Bridgemen made a spot in the Finals after scoring just 47.15 points in their first show of the summer. The corps' increase of 30.55 points over the season is stunning when compared with this year's 11th place corps, Spirit of Atlanta, which picked up 20.30 points from its first show to its last. The second record is the large 20.65-point spread between the 1st and 12th place corps at the Finals. The same spread in 2013 was just 12.85 points. The 9th place Cavaliers celebrated their 35th (jade) anniversary with an original opener composed by (shameless self promotion alert!) your trusty author Michael Boo. The title "Jade" came from then-visual instructor and assistant director Jeff Fiedler. During the first few months of the preseason the piece was known as "Jade Variations." How "Jade" came to be was that the original planned opening piece, an update of the corps' classic "Bully" (played five times by the corps between 1965 and 1970 and brought back as the Cavalier Alumni Corps' opener in 2008), didn't quite resonate with the staff. This was because they realized the tune couldn't be updated enough to work with what was contemporary drum corps at the time. The corps' arranger, due to time constraints, was unable to complete another work for the next winter rehearsal camp, for which the members were promised another opener. I was called and asked if I wanted to give it a try—three days before the camp at which the piece was due. Having never written for bugles before, but the proud holder of a master's degree in composition, I went without sleep for a couple days and "Jade" was the result. The piece was so successful that I haven't been asked to compose another piece for any corps since! Because I could, I selected the last two-thirds of the piece as this week's video clip. "Jade" sneaked off the starting line with an intro from the front ensemble and then brought in the horns with a rhythmic motif combining jazz and Spanish elements. The acrobatic exploits of the color guard members were prominently featured, showing off the prowess of the ensemble that had four months earlier won its third consecutive Winter Guard International World Championship title. In the video clip, you'll notice that the drum line is utilizing triple tenors, which was rather retro as quads were already the norm and the line had previously utilized that configuration. 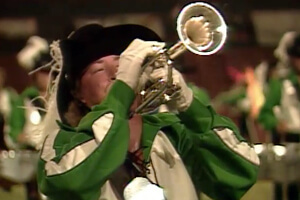 Like the Cavaliers, Bridgemen also played on triple tenors in 1983. Corps staff member Tim Salzman first arranged an earlier version of the standstill concert production of Chick Corea's "Celebration Suite" for the Guardsmen in 1978. The work was based off "No Mystery," the fifth studio album by Return to Forever, a group fronted by keyboardist Corea. The album—winner of the 1975 Grammy Award for Best Jazz Performance by a Group—explored the recently popularized progressive jazz-rock fusion idiom rather than the Latin-infused music for which the ensemble had previously been known. All the members of the band contributed selections to the album, including 20-year-old guitarist Al Di Meola, who would show up in the corps' next selection. "Rendezvous" was the show's percussion feature, based on Di Meola's "Electric Rendezvous" from the 1982 album of the same name. The snare line broke out vibrant reddish drumsticks for the second half, which led into spinning rifles tossed over the heads of the flag twirlers, a distance of 20 yards. Ottorino Respighi's four-movement work, "Pines of Rome," was written in 1924 as the middle symphonic poem in his famed "Roman Trilogy," which also included "Fountains of Rome" and "Roman Festivals." Each of the four movements portrays pine trees in different Roman locations. The Cavaliers started the show's closer with the third movement, "Pines of the Janiculum," a delicate homage to the arrival of night upon a hill outside the western boundaries of the ancient city. The corps worked in a warbling bird whistle, just as Respighi had instructed in his original score. Respighi had the sound of a nightingale recorded upon a phonographic record, to be played at the end of the movement. The resulting shock was classical music's equivalent to drum corps' incursion into electronics, as no noted composer had ever before worked a recorded track into an otherwise totally live symphonic orchestra performance. Vibrant red flags came out for "Pines of the Appian Way," inspired by the most important road in the ancient Roman republic that was built to support the vast Roman army legions. It is said to contain the longest stretch of straight road in all of Europe and was the site of the 71 BC crucifixion of some 6,000 revolting slaves who fought alongside Spartacus in the storied revolt against the Roman Empire. The soldiers can be heard advancing in the music as the day breaks upon the long stretches of road. The movement is one continuous crescendo that starts almost imperceptibly. On the field, it culminated in a triumphant blast of brass and the unraveling of the flags to reveal a much larger silk than what appeared earlier. The front flags advanced to the front sideline, set the silks on the ground, and very quickly manipulated the material into the shape of a triangle. Upon standing up, each adjacent flag bearer held on to a bottom corner of the adjacent flag, maintaining the triangular appearance until the final push. The final spinning of all the massive silks seemed to blur out the back stands of the stadium. At a rehearsal, I heard Jeff Fiedler proclaim during this segment, "It's like Flag Day on Red Square." Perhaps one had to be there, but it was a hysterical observation at the time. For this week only, you can save on the Legacy Collection DVD that contains this complete Cavaliers performance, along with all finalists from the 1983 DCI World Championships. Discount DVD offer ends Monday, Sept. 23 at 8:30 a.m. ET.